Question from Patrick in Ohio: When adjusting the wine’s SO2 content, it is recommended to measure pH and free SO2, then add enough “meta” to achieve the 0.8 ppm molecular level. However, I assume that a proportion of the added SO2 will be rapidly converted to “bound” SO2; therefore, one needs to add MORE than the calculated amount, to achieve the 0.8 molecular level. What rule-of-thumb do you follow, when adjusting the free SO2 content…..how much additional SO2 must be added, in order to account for the proportion that will be bound? Wow Patrick, that’s a great question! The answer requires background explanation so we’ll address it over my next two columns. Before I dive in, let’s take a couple of steps back to make sure everyone is up to speed on what you are specifically asking. (Note if more background information is needed, please see links below). Potassium Metabisulfite (aka PMKS, KPMS, meta), is the most common form of sulfur dioxide (SO2) used in wineries to protect must and wine against microbial spoilage, chemical oxidation (antioxidant) and enzymatic browning/oxidation. Conventionally, only the free portion of SO2 in the molecular form (as SO2) is considered to be the active or effective form, as opposed to other forms present in wine (e.g. bisulfite). Prior to bottling wines, a pH dependent dose of ‘meta’ (targeting 0.8 ppm molecular SO2) is recommended for all whites and sweeter style reds (Note for dry reds 0.5 ppm may be used). The lower the wine pH, the less ‘meta’ is needed to hit a desired free SO2 level because a higher proportion of SO2 is in its active molecular form. And to your point Patrick, inevitably a portion of SO2 added becomes bound SO2 . The question is how much? The obvious answer is to measure before and after modest additions of ‘meta’. From the difference between the total and free SO2 measurements (as measured by ripper, aeration/oxidation methods, etc) one can calculate the bound fraction of SO2 and add extra ‘meta’ accordingly for desired free SO2 concentration. However, this process is after-the-fact and can be cumbersome and inaccurate because not all SO2 added is bound immediately. There are many chemical species that bind to SO2 (anthocyanins, pyruvate, other compounds with carbonyl functional groups to name a few) but I will discuss the practical ramifications of SO2 binding with regards to residual sugar and acetaldehyde. The bound fraction is highly variable, ranging anywhere for 40 – 80% of SO2 added depending on which source you consult. The rule-of-thumb that I use is for any wine with residual sugar (RS) of greater than 0.5 g/L is to use a correction factor of 0.4 (40% will remain as free SO2). However, since this wine is going to be sweet, we need to adjust to the suggested correction factor since a good portion of the ‘meta’ added will become bound (no longer free SO2). In certain scenarios, this calculation may err on the high side but that is a risk I’m willing to take whenever residual sugar is present in the bottle. I consider the extra amount to be an insurance policy. For drier style wines I may chose to use a correction factor of 0.7 (or 70% free) or less. As winemakers we constantly walk the tightrope where too much SO2 can cause perceivable sensory issues and not enough SO2 can lead to microbial and/or oxidative spoilage. One can only learn to make this judgment call through experience. To be continued in Piero’s next column…..
February 2013: More wineries seem to be using more screw caps for cold climate wines. Air transfer from corks can cause discoloration of Marquette and Frontenac Gris. In addition, there are always the random problems with corked wines. Is it time to retire the corker and start using screw caps? It’s been said, ‘if you ask three winemakers about which type of bottle closure they prefer, you’ll get four different responses.” This statement may be an over generalization but indeed, this is one of most hotly debated topics right now amongst industry winemakers and academics alike. One does not need to look any further than the recent profile in the drinks business to see how firmly rooted winemakers are in their defense of which closure is best and why. Disregarding consumer’s preferences and focusing on solely what is best for the wine itself, the modern day winemaker can choose from natural, synthetic, technical (composite), screw top or even glass closures with various degrees of oxygen transmission rates (OTR). OTR is the technical manner in which engineers refer to a closure’s oxygen ‘breathability.” The recent explosion of wine closure options has precipitated from problems with TCA (‘cork taint’) found in the old ‘gold standard’ natural cork. An occurrence of TCA was reportedly as high as 1 out of every 10 bottles. In response, in the past decade, there has been a large push for natural cork makers to improve quality standards as well as a pursuit from natural cork competitors to market their specific advantages over natural cork. From a winemaker’s perspective the number one factor to consider when choosing the proper closure is type of wine (red, white, rosé, etc) and how long the wine will be aged. For rosé and whites that typically are consumed young (< 1 year), a closure that is less likely to ‘breath” such as a screw top may be the right choice. 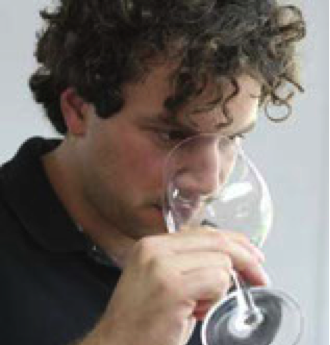 However, the winemaker must take into consideration that flaws in a wine’s aromatic profile may be enhanced by this type of closure as they are less likely to dissipate overtime and therefore it is much more important to correct any faults (especially reduction ‘H2S’) before bottling. 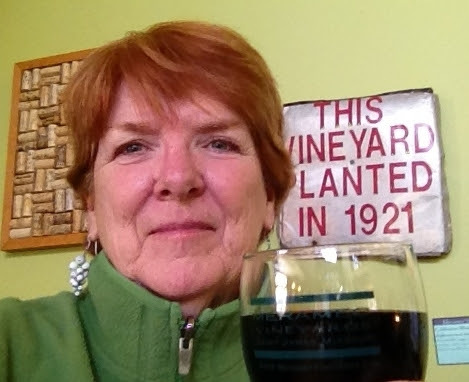 With regards to red hybrid wines, the selection process may not be as straightforward. Typically, reds are aged longer than their white counterparts for a whole host of reasons (polymeric pigment formation, softening of tannins, etc) but because red hybrids lack the tannin content of their V. vinifera counterparts- reportedly 1/4 to 1/5 the amount of tannin found in V. vinifera- I have often wondered if this makes our wines more susceptible to oxidation over time. Tannins are great antioxidants and are used as a natural buffer to shield wine from oxidative spoilage (note – assuming a similar pH, this is in part why reds can typically get by with less sulfite treatment than whites). As such, if the target is to produce an aged (>2 years in bottle) hybrid red varietal/blend, selecting a closure that errors on the side of having a low OTR may be the best option. However, having said that I would not select a closure that has zero OTR as a token amount of oxygen is needed for certain color stability compounds (polymeric pigments) to form, translating into a deeper red color often associated with higher quality wines. I am not aware of any research that can support this claim but this would certainly make for a great study! Speaking of closure studies, one of the most comprehensive studies on closures in the US is currently underway from researchers at UC Davis. In this study, researchers are aging the same lot of Sauvignon blanc under the same conditions with the only difference being the type of closure used: natural cork, synthetic, and screw top. Wines will age for 12 months, while researchers monitor chemical changes in wine over time, and then assess sensory differences amongst wines. Keep your eyes peeled for results to be reported in summer/fall 2013. December 2012: I’ve always wondered about the challenges of fermenting whites in plastic tanks and reds in macro bins. We can’t afford stainless yet, so how can quality be controlled with less than ideal equipment? Limited budgets often make stainless steel tanks a non-option. However, with the need to look elsewhere for fermentation vessels, you don’t necessarily need to sacrifice quality for cost. 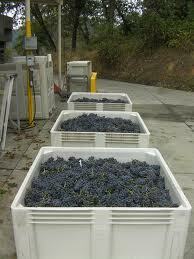 The somewhat recent advent of the polymers (plastics) revolution has given the wine industry macro bins and polytanks. For those not familiar with macro bins, they are rather large rectangular plastic bins that come in various sizes, with the most utilized size being the half-ton bin (a half ton bin can hold ~ 180 gallons of juice and ferment ~135 gallons red juice with skins). Macro bins are a great interim holding spot for grapes during harvest, and are also very useful as a primary fermentation vessel for reds. When macerating reds, floating caps can easily be managed by a cap puncher. (Remember to leave 6 — 8 inches of headspace to allow room for floating caps during an active fermentation and consider purchasing lids to minimize exposure to fruit flies/yellow jackets/etc). Polytanks (from Flextank, Pasco Poly, Synder, and others) come in a vast array of sizes and volumes. Although most polytanks are not optimized for red primary fermentation (due to lack of a manways making pomace removal difficult), their use as secondary fermentation vessels, racking vessels, and/or for aging wines cannot be understated. Some manufactures offer ‘micro” oxygenation rates comparable to wooden barrels; thus with the addition or use of wooden alternatives this offers a cost effective alternative approach. In addition, for macro bins, removal of the grape must/wine requires the use of a forklift (to dump juice/wine/skins into a hopper) or a suction screen probe attached to juice pump to remove juice/wine from pomace. With the pump method, the remaining pomace can be scooped out with a shovel into a press. For very small startups, some good ole’ fashion elbow grease and a couple of 5 gallon buckets may be all you need to transfer macerated skins to a press. It should also be noted that polytanks tend to have higher oxygen transmission rates relative to SS tanks, making oxidation and consequently free SO2 management more crucial. And finally, polytanks are often harder to clean due to limited amounts of ports and manways relative to SS tanks.